The new study takes treatment research into the area of reversing myelin damage. This picture shows myelin (in red) and myelin-producing cells (oligodendrocytes, in green). A breakthrough study looking at how the brain repairs itself could revolutionize treatments for multiple sclerosis. The research, performed on mice and tissue cultures, reveals for the first time that a type of cell involved in immune control also releases a protein that triggers regrowth of myelin. The international study - led by Queen's University Belfast in Northern Ireland, United Kingdom - is published in the journal Nature Neuroscience. Senior author Dr. Denise Fitzgerald - of the University's Wellcome-Wolfson Institute for Experimental Medicine - describes the findings as "an important step forward in understanding how the brain and spinal cord is naturally repaired." Worldwide, more than 2.3 million people are affected by multiple sclerosis (MS) - a disease in which the immune system mistakenly attacks the tissue of the central nervous system, which consists of the brain, spinal cord, and optic nerves. In MS, the immune system attacks and destroys myelin - the fatty, protective sheath that surrounds and insulates nerve fibers. As the myelin damage increases, it disrupts the signals that travel to and from the brain along the affected nerve fibers. This results in a range of symptoms that include impaired mobility, extreme fatigue, vision problems, pain, and altered sensation. Although anyone can develop MS, it is the most common neurological disease in young adults and it affects two to three times more women than men. There is no evidence that MS is hereditary, but it is thought that genes play a role, as well as certain environmental factors such as low vitamin D and smoking tobacco. There is currently no cure for MS, although some approved drugs appear to reduce frequency of relapses and delay disease progression to some extent. The researchers are excited about their discovery because it takes treatment research into the area of reversing myelin damage. Dr. Fitzgerald has a personal as well as a professional interest in MS - when she was 21, she had to learn to walk again after experiencing a similar condition called transverse myelitis. 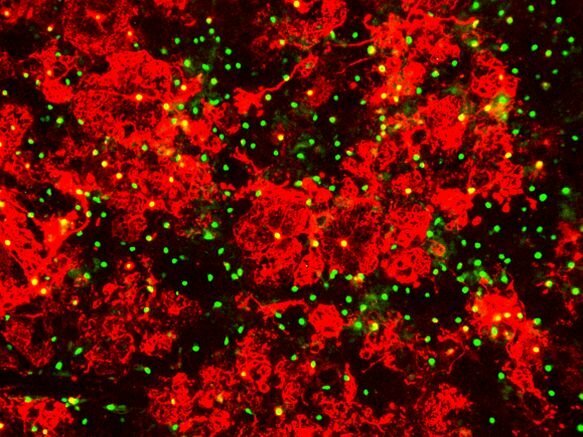 The study concerns a type of immune cell called T cells, which, in cases of MS, are known to cross over from the bloodstream into the central nervous system. Dr. Fitzgerald and colleagues discovered that a subtype of T cells called regulatory T cells - which are already known to be involved in regulating the immune system - also have a role in promoting myelin regrowth. The regulatory T cells promote myelin regrowth through their effect on oligodendrocytes - the cells that make myelin. The process of myelin regrowth requires oligodendrocyte progenitor cells to mature into oligodendrocyte cells. The researchers found that regulatory T cells release a protein that stimulates the differentiation of the progenitor cells into mature oligodendrocytes. They showed that mice deficient in regulatory T cells showed substantially impaired myelin regeneration, which was restored when they transferred regulatory T cells into the mice. Using cultured brain tissue, the researchers also showed that regulatory T cells "accelerated developmental myelination and remyelination, even in the absence of overt inflammation."